The Story: Madame Tang colludes and mediates between the government and the private businesses for the benefits of her all-female family. 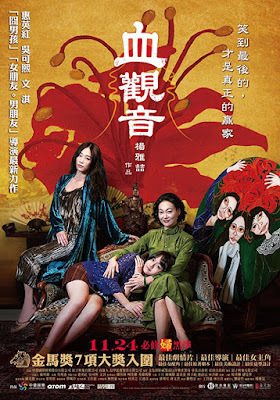 One case does not go according to plan, and an entire family close to Madame Tang fall victim to a gruesome murder. Ambition, desire and lust eventually change Tang's relationships with her own family forever. Ya-che Yang's first feature film in five years goes deep into the world of corrupt Taiwanese politics and family dynamics where secrets are more valuable than any other form of currency. The director takes a very methodical and deliberate approach to the story letting the cast dig deep into their roles and it ends up being a slow burning, soap opera style drama. The story, quite honestly left me underwhelmed and uninterested although the character drama and fantastic performances are what kept me engaged through to the end. The Bold, The Corrupt, and The Beautiful is an official selection of SIFF 2018.